AIR TRAFFIC CONTROL SYSTEMS - WASKO S.A. 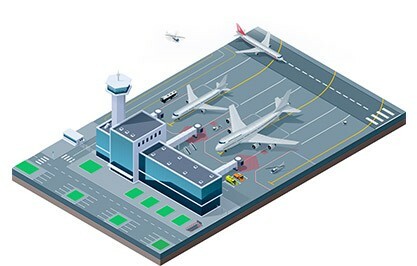 The offer of contruction of Air Traffic Control Systems is dedicated at all organisational units of Polish Air Navigations Systems Agency as well as managers of airports. WASKO SA for many years has been cooperating with these institutions, the result of the cooperation being many turn-key projects (design, build and launch) in the field of CNS (Communication, Navigation and Survailance) and ATC (Air Traffic Control). WASKO SA delivers and implements solutions of leading world radio communications producers (VHF/UHF radio stations) and radio navigation (navigation devices DME, DVOR, ILS). We have partner agreements with the highest evaluated producers of subsystems, components and supplementing elements i.e. specialised VHF/UHF antenna systems, radio filters, devices for wired communications (multiplexers, routers and network relays), optical converters for data transmission, aviation signaling lamps, specialist installation racks as well as many subsystems necessary for each such implementation. WASKO service is complex and it covers coordination of works and supervision over building subcontractors as well as producers of concrete teletechnical containers, towers and prestressed concrete masts and steel constructions. The most important value of the WASKO offer are highly qualified and experienced engineers in the field of designing objects and infrastructure as well as managing and administering projects. WASKO possesses a team of specialists with the highest qualifications in installation, configuration and maintenance of the offered solutions. They hold certificates issued by producers as the outcomes specialist trainings. Why is it worth choosing WASKO? Appropriate financial and HR potential for management of investment undertakings.